One of Russia's grandest sports arenas is getting a major upgrade that will offer visitors a beautiful outdoor atmosphere any time of year, thanks to a new partnership with Canadian developer OpenAire. Luzhniki Olympic Complex, located in Moscow, has teamed with OpenAire to create a customized retractable skylight for its expansive Aquapark facility. This 6,947 square meter (74,776 square feet), curved roof enclosure will create a unique environment for swimmers of all ages, opening up to the sun and fresh air of warm days, yet closing quickly and securely at the first sign of precipitation or in cold weather. The result is an outdoor-style pool that can operate and stay warm through Moscow's bitter winters. Luzhniki Olympic Complex gets ready for 2018 FIFA World Cup with a new retractable skylight by OpenAire. This renovation comes just as Luzhniki Olympic Complex takes its place on the world stage to host the 2018 FIFA World Cup. The sweeping, dynamic architecture of OpenAire's enclosure will help to showcase the complex's continued innovation. Covering 153 hectares, Luzhniki has been one of the world's largest sports complexes since its completion in 1956 and has previously hosted the 1980 Summer Olympic Games. OpenAire's design and installation teams are excited to create an operable skylight that lives up to the arena's ambitious history. "We are very excited to have this chance to help renovate a world-class arena. It's an honor that Luzhniki has chosen OpenAire's unique architectural solutions for its Aquapark," says Mark Albertine, President and CEO of OpenAire, "Our team is well-equipped for large-scale projects like this. In 2012, we were a key partner in designing and building the world's largest free-standing retractable aluminum dome for the Royal Marine Waterpark in Donetsk, Ukraine, in time for the European Football Championship. That design attracted international attention and lines of visitors year-round. 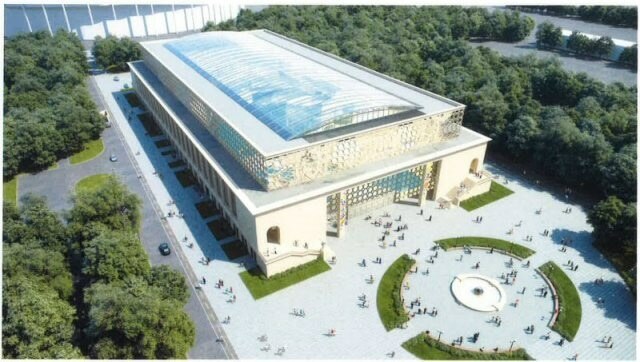 I'm sure this OpenAire skylight will do the same for Luzhniki Olympic Complex. Direct sunlight and fresh air combined with the security of an indoor setting captures people's senses in a unique way." The lightweight, aluminum-framed enclosure will measure 50.93m (167'-1"), wide by 138.647m (454'-10"), long and rest on two 1 metre-high sidewalls and two vertical ends. The length is divided into 25 bays spaced 6m (19'-8"), apart, with 10 motorized roof panels that open smoothly and quickly thanks to a custom-designed rack and pinion motor system provided by OpenAire. The result will be a state-of-the-art skylight that opens and closes seamlessly with the changing weather and gives an unobstructed view of the outside sky. Apart from creating an unforgettable outdoor atmosphere, the new enclosure will also provide substantial energy and maintenance savings for the Luzhniki Aquapark's operators. When opened, the structure's panels will let in ample sunlight and fresh air, reducing the need for air-conditioning in the summer. And when closed in the winter, the skylight provides ample solar gain to reduce required heating, not to mention the year-round natural light eliminates the need for artificial lighting during daylight hours. The all-aluminum truss system is also fully corrosion proof and will never require maintenance. The result is an attractive aquatic center that is energy efficient and built to last. The Luzhniki Olympic Complex's renovations are sure to be a monumental achievement for the arena and OpenAire in 2016. OpenAire's signature modern architecture and precision-crafted retractable skylight systems, combined with the magnificent design of Russia's premier sports complex, will certainly make a lasting impression on athletes and visitors for years to come.